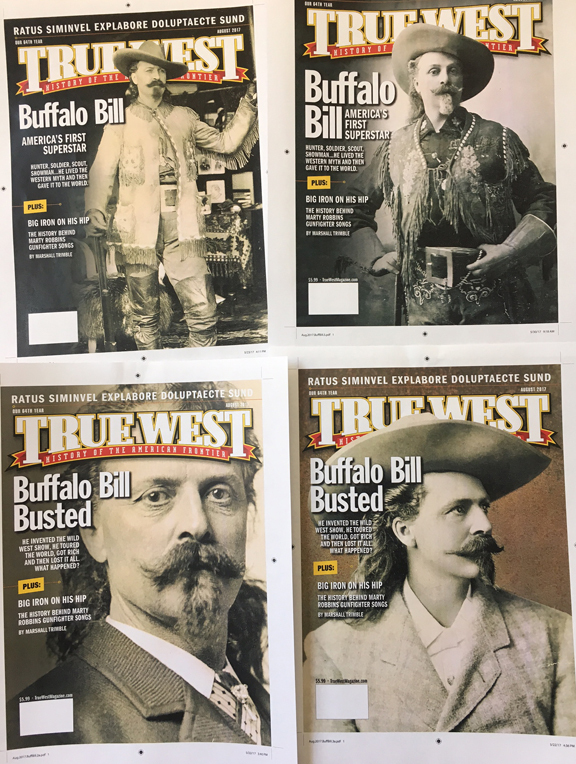 It's been said, every great idea makes someone pucker, and Buffalo Bill had a great idea: what if he took his successful, indoor, stage show and put on an outdoor, frontier extravaganza, with an Indian camp, cowboys, a stagecoach, and then, utilizing the railroad, load up 250 actors, horses and as many stagehands—who would need to be fed three times a day—and chug on down to the next town and put on another show. I read somewhere that the first tour lost money (I want to say $80,000) but Cody had the huevos to keep going and take this lumbering idea out on a second tour. Now, if you had $55,000 of your own money in an idea like this that lost money, would you go out again? Not me. I'm puckered just thinking about losing that kind of money. But he did and the rest is history. 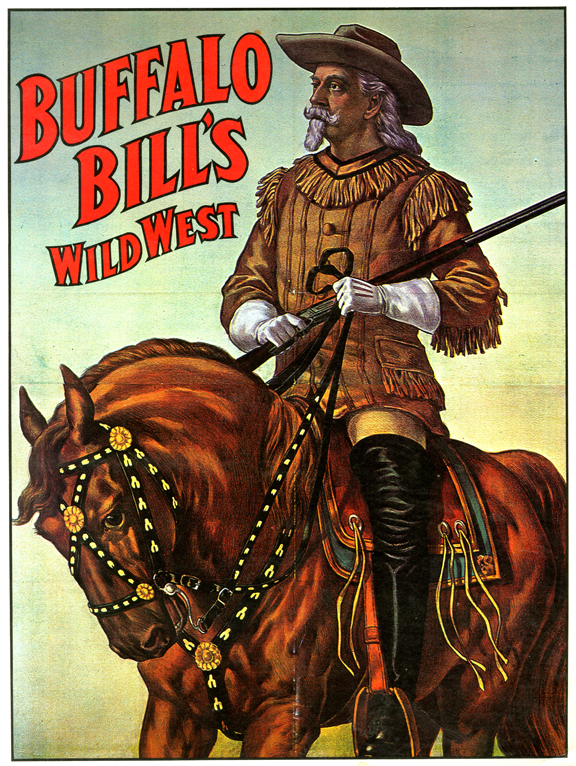 Everyone knows about Buffalo Bill's Wild West show (by the way, he NEVER called it a "show") but most have forgotten just how incredibly impactful it was, both in the United States and on the world stage. So we asked The Top Secret Writer to give us a short introduction on: Why He Still Matters. Hutton is so good. 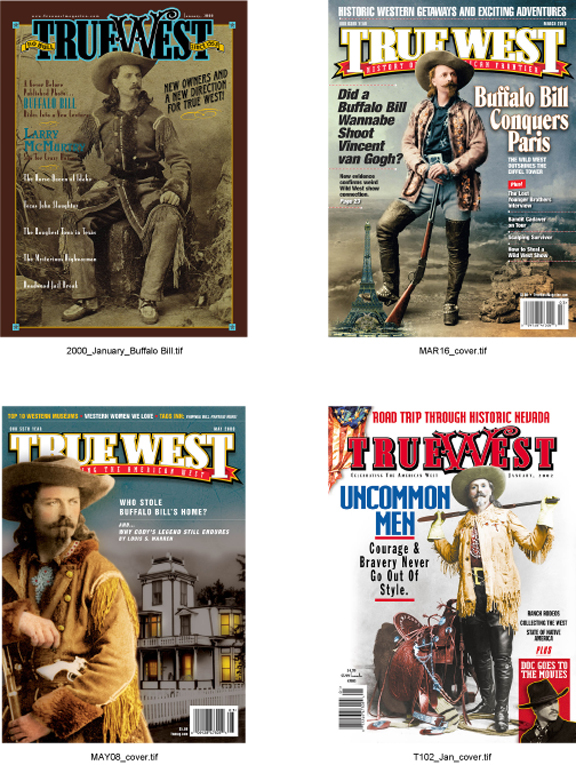 Here's a taste: "He was, like the nation he came to symbolize, a bundle of contradictions: a hunter who became a conservationist; a friend to American Indians who was famed as an Indian fighter; a rugged frontier scout best remembered as a sequenced showman; a living artifact of a pioneer past playing out his role in a world of telephones, motion pictures, automobiles, airplanes, skyscrapers and world wars." In spite of all the massive grooviness, we ended up with none of these. Two were considered too negative, one was considered misleading and the last one was criticized because as one of our outspoken staffers put it, Cody looks like a "damn banker." Still, by all accounts, featuring Cody on the cover is a great idea, but guess who is puckering? Me. The problem for me is Cody has never really done that well for us on the newsstand. We have featured him on four covers in the past 18 years, and, well, they all performed so-so. Is it the design? Is it the cover headlines? Or, lack of them? We'll soon find out. It goes to press tomorrow. "Yellow Hand was the only Indian I ever scalped. I did not believe in scalping."